My advice to you? Crossfit is something that takes time to fully adapt to. You need to take your time and take it slowly. You might risk injury, and you don’t want to be put to rest for two months! The advantage that comes with dumbbells is that your body movements are much more natural, and this results in less stress on your muscles. I have used the Bowflex SelectTech, and if you followed my review, you will find that the design and price sealed the deal for most. When I got the StairMaster adjustable dumbbells, I was hard-pressed to ask myself this: was the price worth it? StairMaster has been manufacturing gym equipment for almost forty long years now. That’s a lot of time, and in this time, they have fine-tuned their manufacturing to make good products that meet the need of the consumers. The StairMaster 4000PT is on the trend-setting products that have come out of this company. They also made a new type of chin and dip machine, which gained popularity. Back in 2011, they were the first to have features such as iPod connectivity built into their StairMaster series. All of their products are built keeping in mind the people who would be interested in toning their body. You’d find their products in most commercial gyms, and they are a part of a larger group known as corehandf. They have a very diverse portfolio with a large number of brands working under them. The StairMaster starts with a weight range starting at just 5 lbs and goes up all the way tto100 lbs. The benefit of this is that users of all fitness levels can use this product. The USP of this product is that there are no knobs to turn, pins to align, or levers to slide – you just twist the lever into place and start using them. This means that their will be minimal breaks during your workout, which is essential for intense workouts. The quality of construction is excellent and is much better than the non-rubberized static weight sets that you come across. The outer side of these is made of plastic which acts as a covering, while the inner side is made of metal. Unlike other power blocks, these have a shape that matches the shape of a dumbbell the most. Increments: You can have 19 increments, each increment of 5 lbs. Good shape: These have a natural shape, which makes it easier to hold and exercise compared to the other power blocks. 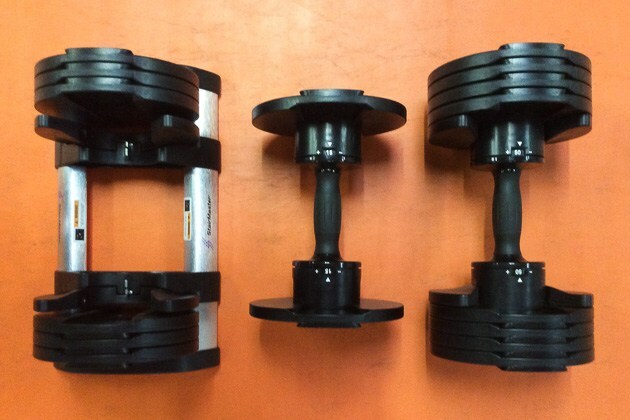 Price: people might be hard-pressed to pay $500 for a set of dumbbells when building a home gym on a budget. A large number of people talked about how these sets are much easier to use than Powerblock adjustments. You don’t feel as though the weights will come apart if the angle is off, which was one of my concerns as well. When you compare these to the standard weight set, these are superior to non-rubberized static weight sets that you would come across. Overall, for a home gym that requires space saving equipment, these are wonderful. The entirety of the negative reviews for this product are having two chief complaints – price and longevity. A large number of the review point out to the fact that charging $500 for 50 lbs of weight is outrageous since the next best competitor with 50 lbs comes in at $300. A 200 dollar surcharge with a warranty of only two years is a deal-breaker for many. However, since then the manufacturer has thrown in an extra 50 lbs for no cost, making this an interesting deal. Also, some reviews said that the warranty of two years is very less, which is a valid complaint. People said that you need to be careful about putting these down. I’ve always maintained that throwing weights around is not a good idea. Someone could get seriously hurt doing that. You could pick these up at a bunch of places, but I generally stick to Amazon for my purchases as dealing with returns on Amazon is hassle-free, and a lot of items I buy get damaged in transit. 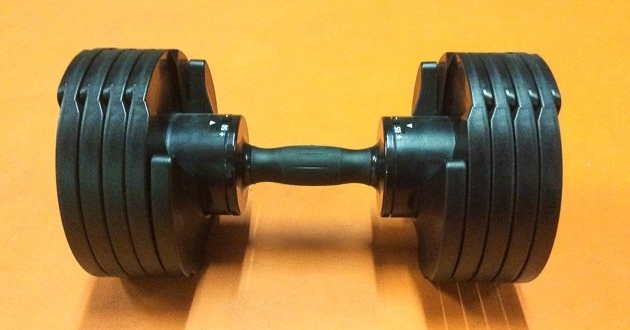 One of the biggest complaints on Amazon has been about the staggering price that these dumbbells carry. However, the manufacturer added 50 pounds extra weight for basically the same price, which gives it a value that is definitely hard to beat. These come in at $499 for 100 pounds on Amazon. This is definitely a sizeable investment, and if you are looking to build a home gym, I’d recommend these to you. I have used powerblocks before, and the rectangular size makes life difficult as they are bulky. These are pretty great since you don’t really have to fumble around with pins or the other locking mechanisms that manufacturers provide. All you need to do is twist these into place, and start using them. It’s one of the fastest things ever – so fast that once you use them you just can’t go back! I hate the amount of noise that a lot of the adjustable dumbbell kits make. These are really quiet in use. Hearing them go clink-clank all the time gets on my nerves for some reason, so these are quite an improvement. The design of the dumbbells in itself is as natural as possible, which makes workouts that much more fun. The grip is good, and definitely not slippery. These are indeed one of the best dumbbells on the market, though there are a few qualms here and there. The mechanism to select the required weight definitely looks a little delicate but I have not had any issues with them so far. However, the only thing that can really damage this thing is if you drop it a lot. I don’t drop things with a lot of force, so I have not yet seen any damage on my unit till date. The only other issue is that if you put it at maximum weight it sticks to the rack. I have a stand for it, which fixes this issue. If you are getting these, getting the Stairmaster twistlock stand is a no-brainer when it comes to accessories. 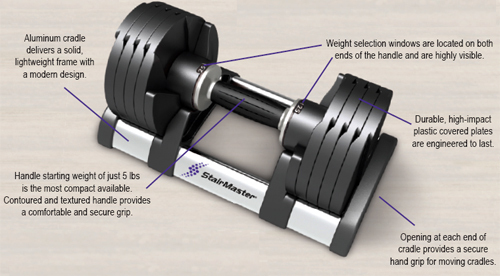 The easy access design is made for the dumbbells, and it helps with posture while picking up the dumbbells. The design is compact enough, and it’s coated with silver paint. 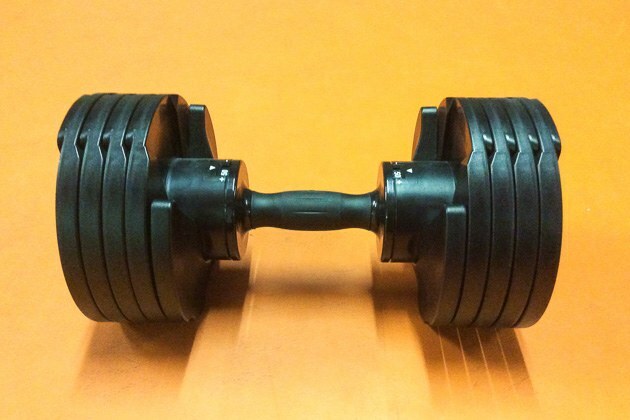 Without the stand, the dumbbells tend to pick up the cradle when you lift the entire weight of 50 lbs. The ergonomical advantage you gain on getting these is worth the investment. Setting them up is a breeze, and the instructions are detailed. You could have them all ready in 20 minutes or so.